These delicious caramels are a one of my new favorites! I’m sure everyone is familiar with the Werther’s Original caramels. I have always liked them, though I am not that much of a hard candy eater. Werther’s Chewy Caramel are great, and you wouldn’t think they could be improved much. But enter Soft Crème Caramels – these takes caramels to a whole new level. I remember making homemade caramels growing up, and how if you stirred the caramels too much while it was cooking, it might end up crystalized in the end. I never minded this much as I liked the crystalized caramels. These are kinda like that, but much better. The have a texture that are soft and creamy and grainy at the same time. Because they are so easy to chew you end up with a mouthful of crumbly delicious caramel. The biggest problem with the Werthers Soft Crème Caramels is that they are so hard to find! 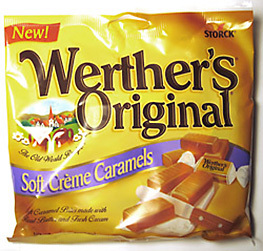 Most stores have a section with a range of Werther’s products, but only very few of them seems to stock the Soft Crème Caramels. In fact, even the Official Werther’s Website makes no mention of the Soft Crème Caramels. This is a bit alarming, as I hope they will not be discontinued anytime soon! If you are a caramel fan and happen to run across these (look for the purple label) I highly recommend picking up a few bags. Yuck: They are so soft and quick to eat that you’ll finish a bag before you know it! I love those soft caramels but could only find them ONE time at CVS. Where can I order some. It looks like the best chance of finding these are at RiteAid pharmacies. Some Walmart stores also carries them, but that seems to be more hit or miss.